I’ve literally been on the go all day and away from my laptop (gasp!). My eats were rather random today but tasty nevertheless! 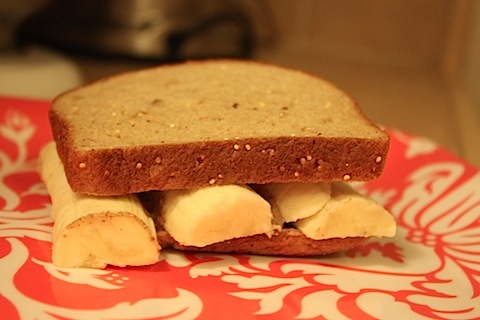 Breakfast was something different….an almond butter and banana sandwich on TJ’s quinoa bread. For some reason I just wasn’t feelin’ the oats this morning. And then had an early lunch before taking the boy to the airport in san francisco because he’s going out of town for the next few days. 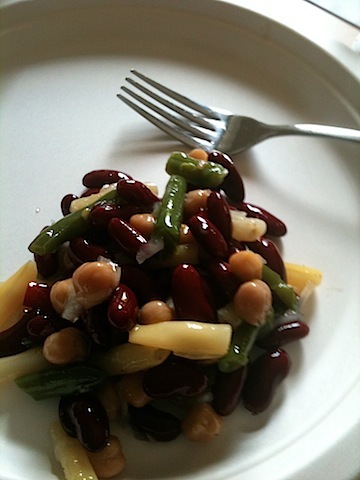 There was meatloaf and mashed potatoes available but I grabbed this three bean salad instead (from the local gourmet-ish grocery store) because I’m not the biggest meatloaf fan and I wasn’t very hungry anyway (however, HE loved his meatloaf and mashed potatoes. tehehe boys). 😉 This salad was actually pretty tasty though and I had another apple with it to boot! After almost pulling my hair out in california rush hour traffic, I finally got home around 5:30 and heated up (fast!) a bowl of split pea soup from the other night. Love putting an egg on top! Really bumps up the protein and filling factor. Now, I don’t know if I would try this at home but I actually went on a run an hour after eating this dinner. 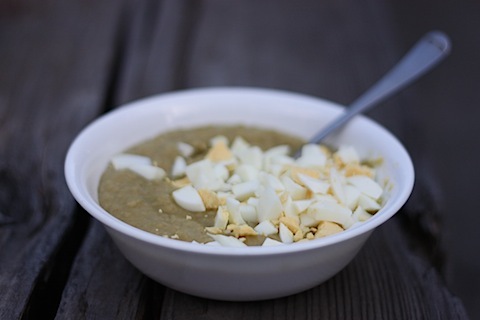 Split pea soup as a pre-exercise meal? Absolutely. However, let it be noted that I have a tummy of steel (knock on wood) and can pretty much eat whatever/whenever before exercising. I headed over to the local high school track and ran 2 miles on the springy ground! Gosh, it felt better on my shins than concrete…I honestly don’t know if I have ever run on a track before (we didn’t have one at my high school) and I might be addicted now. I can see how anything over 2 miles would be boring going around and around but there was a baseball game going on and I pretended I was 17 again, running laps around the football field in the Florida heat during varsity tennis practice. 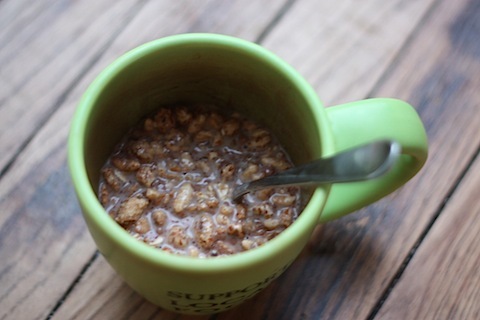 I mixed together in my favorite green mug 1/2 cup TJ’s high protein cereal (a kashi go lean knock-off!) 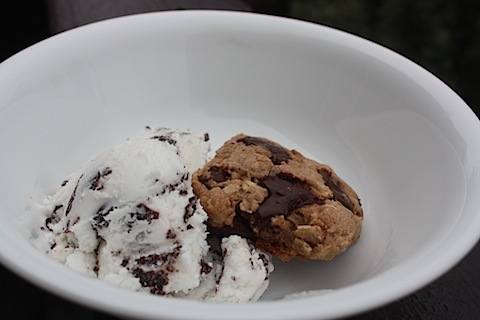 + 1/2 cup almond milk mixed with 1/2 scoop chocolate protein powder. I mixed the almond milk and the protein powder together first in a little bowl and then poured it over the cereal. It was SO GOOD! Actually, it reminded me a lot of cocoa krispies…when the milk turns chocolatey from the cereal, ya know?! My mom only let my brother and I have “sugar cereals” for dessert…never for breakfast…so this was a fun nostalgic “treat”. Definitely will be repeating it soon! I’m BEAT. Finally got really into my book last night and looking forward to soaking my sore muscles in the tub then cozying in and reading the night away. OH MY GOSH your dessert sounds amazing!!! I was wondering, what kind of protein powder do you use? I’ve been trying to find a good one. yum! the cereal sounds amazing! what protein powder did you use? I so so so wish my tummy would toughen up! I can’t eat anything within 4 hours of running. FOUR!! It’s crazy. I get cramps if there’s a pebbly of rice in there haha. I love running on the track although I never do it really. I do find that it is much softer. Hahaha I literally JUST posted about my random on the go eats. I was running all day too! That soup looks great and I love the egg addition! Wow what a busy day!! Love the idea of adding the egg to your soup!! love the cereal idea!! My mom only let us have “sugary” cereal for desert too, and to this day, it is still a treat to me. I’ll have to try it! Glad you enjoyed the track run too-don’t you wish sidewalks felt like that?? 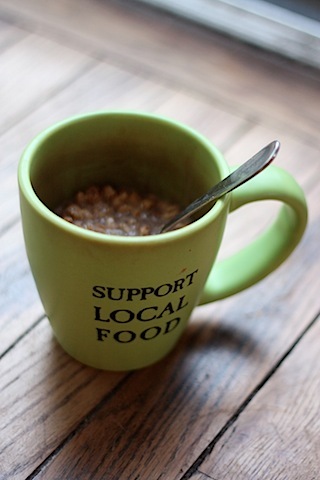 I love your healthy twist on cocoa krispies. 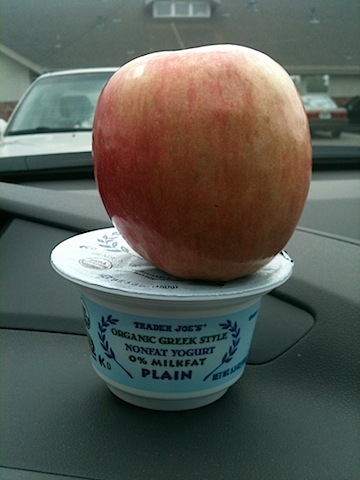 That apple looks like King Kong compared to that yogurt! Oh, how I love mondo-sized apples. Anyways… The soup with the egg looked really good… I have a can of Amy’s Organic Split Pea in my cupboard and I might just have to try that. How long are you going to keep us in suspense about the boy??? No fair! Varsity tennis? Me too! Knew we were soul sistas. 🙂 Love the hardboiled egg on top of soup idea, I looooove hardboiled eggs. Running on a track feels amazing in comparison. I have a track literally next door to my house but rarely run it. Even though it’s better for my joints, I get bored running in a circle. And tips? I do not have a stomach of steel- I would not be making friends at the gym after a bowl of pea soup- I am somewhat jealous of you for that! Haha, before reading, I thought your banana was parsnip in the first picture. I 3rd the request for boy information. Nice dessert! You are a wonderfully beautiful person. I think you have a wise and balanced idea of health – in body, mind and spirit. You are YOU through and through which is why your blog is so addicting. So if you wanna wear a blue dress and you’re willing to do what it takes to get there, then wear that blue dress dangit! And wear it proudly with a smile on your face. I am VERY thankful for my iron stomach too! I haven’t gotten ‘sick’ since 7th grade – wahoo…knock on wood. Seriously ain’t nothing wrong with a little privacy! Stomach of steel? Woow i’m so jealous, right now my stomach s giving me so much trouble 🙁 i’m going to cut back on caffeine, dairy, artificial sweetners and wheat to see if any of it is causing it. Hey Jenna! I see that you’re a pretty big TJ’s fan. 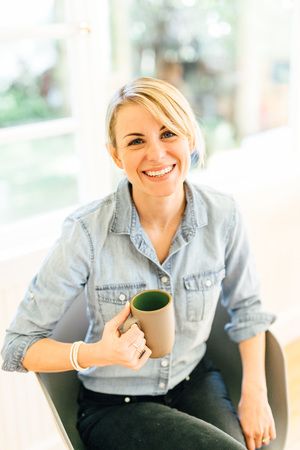 I work at one in Maryland, and as an ambassador from the best store in the world, I was wondering if you’ve ever had our almond and peanut butters with flax seeds? I just tried them recently, and holy hannah are they amazing. They come in squat plastic jars and have a red or green top (peanut is red, almond is green) From one TJs/nut butter fan to another, you should definitely give them a try! Great idea about the running track – I’m definitely going to investigate and see if there are any near me. It’ll hopefully be kinder on my knees than concrete! I always eat cereal with protein and milk! It’s yummy! i don’t reply often, but enjoy your blog! i was in santa rosa two weeks ago and loved it – glad you are thinking about moving there. we ate such amazing food. also – i love love love that you keep the boy a mystery. i am such a fan of privacy and wanted to acknowledge your choice to keep it. cheers! What a busy day. Yes random food choices but good ones none the less. Is this powder the chocolate amazing grass? I agree that running on a track is SO much more cushy than running on the street…but it gets so boring! 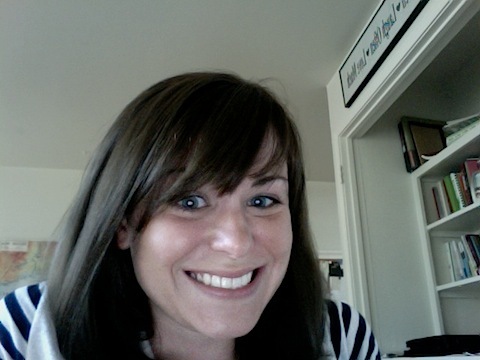 I’ve been enjoying your posts lately, Jenna! I feel like you’re back to your old self…throwing in random, fun tidbits from your day. It’s so refreshing. Stay lovely and God bless! We only had sugar cereals for dessert growing up as well. Somehow my little brother managed to convince my parent’s that honey nut cherrios were okay though. I may have to revisit the track idea – I’ve only ever run on one once but maybe it would be good for me? I tend to eat whatever before running, too, BUT my body will go all wacky on me if I try to eat eggs before a hard workout. I can have them after, but before? Nope! That cereal treat sounds great. I’m going to have to check out that brand. I’m all for Kashi knock-offs if they’re cheaper! That does look like cocoa crispies! Yum! I love using use chocolate protein powder with cereal. One combo I came up with that is really good: chocolate protein powder, kashi go lean cereal, and almond milk. Then top it off with sliced strawberries and bananas. It’s like a cereal banana split!! I hope you are doing well Jenna! My stomach is wreaking havoc with me though no matter what I eat…I think I combine too much…a case of the TOO’s especially late at night…and alot of nut butters. And yet I cannot stop! Makes me so icky though . Are you still writing now? 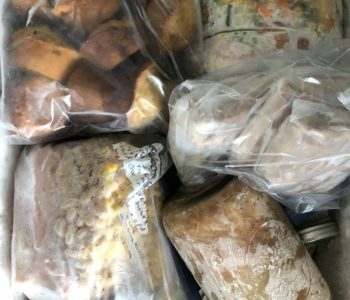 I hate hate hate meatloaf, and my entire family thinks I’m weird because of it. 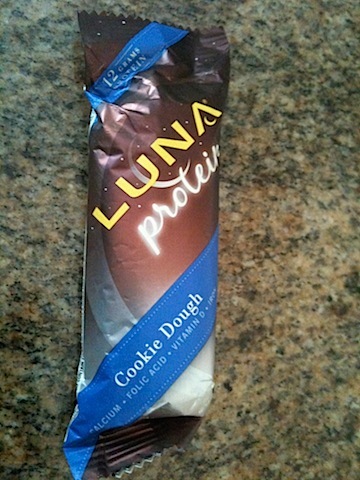 I’m dying to try that Cookie Dough Luna Bar! That’s a good idea for cereal! And I’ve been stuck in San Francisco rush hour before…not pretty. Not pretty at all. It’s funny because Pittsburgh’s rush hour is no big deal at all. It’s been forever since I’ve run on a track! It would be a good idea for interval runs! My stomach is made of steel, too! I can eat the hugest plate of food, then step right outside of my door and run three miles. Don’t you just love that? I am also curious about what type of protein powder you use! I use either Jay Robb protein powder or Designer Whey! Ohhhh I never saw that Luna flavor before. It looks delicious! I wish I knew where a track was near me, it would be a lot better for my knees which have started hurting. But I agree, anything more than 2 miles would be killer..boredom wise. I need yoga in my life again! My wallet hasn’t been letting me go to classes lately, but hopefully soon! My mom was the same way about sugar cereals… even now they are still such a treat when I have them! Haha…my track event is now the 10k- 6.2 miles on a track! Luckily racing makes it a little less boring, but it’s hard to keep track of the laps! (In high school the longest distance was the 2 mile, which was my specialty…funny how my definition of “long race” changed! Ha I did almost the exact same thing once last year- I wanted kashi g lean but was out of milk so I used a free sample I had of chocolate soy milk– it was delicious! You know, I’m going to give the new track at my local high school a try. I’ve been running on an old asphalt track lately. (I’m running on the track because I’ve been nursing a shin injury. I don’t want to get too far from home/transportation if it gets too sore, so the track has been my friend lately). You must have a stomach of steel. I can’t eat for 2 hours before I run or I get sick. I love egg on soup. Especially a lightly fried one that kind of oozes into the soup… makes it so rich and creamy tasting!